Welcome readers. I hope that 2017 has been going good for you so far. For me, since work has slowed down some I am able to focus some of my energy to other things in life. Which is great since my honey do list seems to be a mile long. I don’t mind since I enjoy staying busy anyways. So far this year we have seen the markets close at an unprecedented high of over 20k. For anyone who is looking to take profits, I am sure that they love seeing this. For anyone who is looking for buying opportunities though is probably having a difficult time. There are some deals out there though. The Fed has left the interest rates unchanged at the moment but still reportedly plan to have 3 increase during the year. I am very interested to see how all of that plays out. 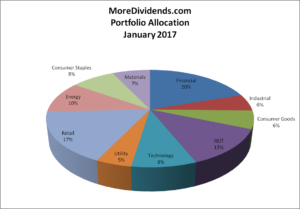 During January, I have been able to get back into the swing of blogging more, I added some stocks to my portfolio as well as receiving dividends. So I have been able to continue growing my portfolio despite the market being priced so expensively. So let’s jump in and look at the update for January. During January, I didn’t open any new positions but I did add to some of my existing positions in my Portfolio. This will add $22.56 to Dividend Income for the year. I’m continuing to pick my spots to add more capital to my holdings. Even these small additions will add up over time. January is not one of my strongest months but it is slowly growing. Every little bit counts!!! January was the first month of Q1 and accounted for $6.85 of my 2017 Dividend Income. As we can see here based on my dividends received in December, my YoY growth is 287%. While this is a fantastic growth rate, I know that it will be hard to maintain such a large growth rate as my portfolio grows. My portfolio has grown large enough so that fresh capital doesn’t affect the allocation tremendously. With the recent addition of some shares in Target I can see that the Retail sector is one of my larger allocations. I am comfortable with the current allocation but am not looking to add to this sector at the moment. The same can also be said about the Financial sector. I will keep this in mind as I continue to look for more buying opportunities in the future. I am very please with my current portfolio. I feel like it is pretty well diversified with some great companies that will be able to continue to grow their dividends in the future. I will continue to add to my existing positions as long as it keeps my allocation balanced and the price is below my cost basis. I am open to adding new positions but will be very selective of what I am willing to add to my portfolio. Here are the articles that I posted on here during January. January turned out to be a good month for me. The month provided me with a little bit of everything from some additions to some dividends paid. 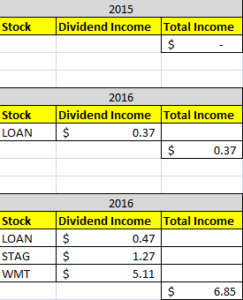 I will continue to search out good ways to put more money to work here in the MoreDividends Portfolio. I have some stocks on my radar that I will be posting about soon for my Watch List. I have also been reading the Peter Lynch classic One Up On Wallstreet, so look for my thoughts on the book in an upcoming post. 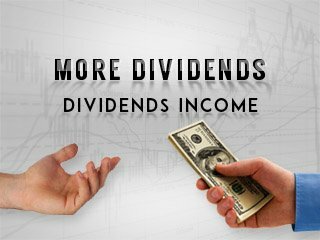 Be sure to follow me on Twitter @MoreDividends. I look forward to reading all of your comments and questions, until then….. happy investing! More Dividends Update From October 2017 Welcome back readers. October turned out to be an interestingly busy month for me. Should be a good year for you I am thinking! I wish you all the best for the months to come. Every bit counts. Seeing where you came from in 2015 to today shows consistent growth. Sure, not the biggest month for us dividend bloggers but still a month that we can show growth. Keep building up that portfolio with thos solid dividend payers as you have been adding to last month. Congrats on getting some money from dividends. It’s some free money that will continue to growth. Sounds like a great start to 2017, well done!! Great start of the year. I’m looking forward to see the progress. Your portfolio net worth resembles the same value as my kids portfolio we kicked off this year.